Before my sleeper bus experience, I had never imagined being asked to take my shoes off as I entered a public bus. But when you get on an overnight sleeper bus, it makes a lot of sense. An attendant held out a black plastic bag for me to place my shoes in. 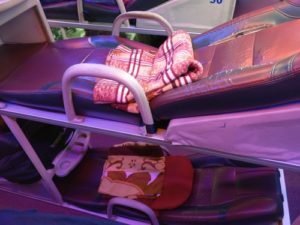 I continued barefoot down the aisle to my very own reclined sleeper seat. This was my first experience traveling in Vietnam. I really haven’t traveled much in Asia at all so my perspective is obviously skewed by lack of experience. But I enjoyed it so much I felt the need to share. Hopefully, in the future, I will find more opportunities to take sleeper buses and save money while reaching my destination. It is one of the cheapest travel options and also saves you from paying for a hostel or hotel for the night. 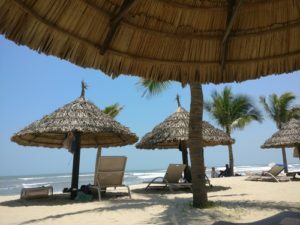 It’s definitely a plus for budget travelers in Vietnam! This was really exciting for me. I thought this might be the one way to travel where it actually helps to have narcolepsy! That is if you are someone like me that generally sleeps through anything. Even if I am constantly waking up, I am usually unaware of it and have little to no memory of it happening. I was told this bus would take 17 hours from Hanoi to Da Nang. So my goal was to sleep at least half of that. I would say I was pretty successful! I came prepared. 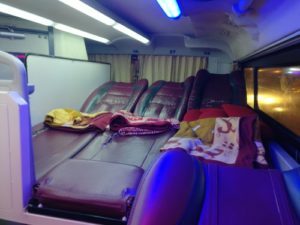 Here are my tips for riding a sleeper bus in Vietnam. 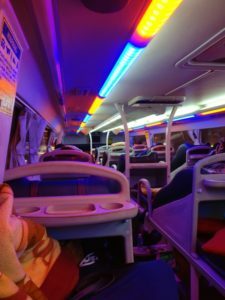 Do research before you book tickets for a sleeper bus in Vietnam. Unfortunately, this is a country where I found it was easy to get ripped off. In my case, it was cheaper to book a bus through my hotel than it was to buy the tickets online. I had been in the hotel almost a week and had a decent rapport with the owner. So I trusted him. He also arranged for me to be picked up at the hotel. This was much easier than finding the bus station and the proper bus myself. I did have to be rather laid back, as I had no idea what company I was booked with or any details about the trip other than my pick up time. Wear your most comfortable clothes and consider the weather for your ride. It was raining during mine so I made sure I wasn’t wearing anything that takes a long time to dry. I kept two thin jackets with me, one to wear in the rain and one to stay dry inside the sleeper bus. There was a hook to hang the wet one on during the ride. I also took warm comfortable socks since buses tend to be cold. All of your valuables, passport, electronics, money, or anything fragile you don’t want banging around under the bus for hours. A thin sleeping bag, a sheet, or something to put between yourself and the seat if you are worried about germs. If not, just something to cover up with works fine. I just used the same piece of fabric I use when I lay out on the beach. I don´t recommend the back unless you want to be cuddling the person in the middle seat! Socks are a plus since shoes aren’t allowed. I had some yoga socks with rubber pads I chose to wear for warmth. But also, if you need to use the bathroom on the bus, at least there will be something between your bare feet and the floor. Earplugs are a must, even if you are a heavy sleeper. People talking on the phone, traffic, and the bus driver honking the horn are issues at all hours of the night. A sleep mask is also a plus since there are random stops to pick up more people, take meal breaks, and change drivers. When the bus stops all the lights come on. I don’t know how many of these I slept through. Of course, you don’t want to get dehydrated so you have to drink some water. But carry along toilet paper and hand sanitizer for the dreaded sleeper bus toilet experience! Last but not least, take along some sort of entertainment. My bus did not have an outlet to charge any electronics so I was grateful for an old-fashioned book and my backup phone fully charged and full of music. I pictured myself being productive and doing things on my computer during the long journey but once in my seat it really didn’t seem possible. This, of course, goes without saying. You always want to be aware of where your personal belongings are when you travel. But when sleeping, it’s especially difficult to be vigilant. I attached my backpack to the seat. My purse strap hooked around a part of the chair so that anyone trying to steal them would have extra obstacles. I don’t know if it would have prevented a real thief if they knew how heavily I was sleeping, but luckily I didn’t have any issues. Have your accommodation booked in advance. When you get to your destination there will be plenty of people ready to sell you whatever they think you want next. They know when the sleeper bus arrives and tired travelers are easy targets. If you already have your accommodation booked you can grab your bag and move away from the chaos. I just booked a Grab from there so I didn’t have to haggle a price or deal with the rigged taxi meters. I know there is a lot of controversy about riding overnight buses because of the danger involved. There are plenty of new stories about bus wrecks and drivers falling asleep. I understand this is a risk and if it worries you, there are other options! There are plenty of flights between the major tourist destinations and they aren’t all that expensive. I was planning to fly until I realized I had waited too long and the flights I would have liked to take were fully booked, or the price had gone up. But if you are a planner, domestic flights are definitely an option, and many travelers find flying to be safer than riding the bus. There are such strict regulations on air travel it does offer some sense of security. However, I actually enjoyed my sleeper but experience. Even though it was raining, and the first part of the trip was in heavy traffic, I didn’t feel that uncomfortable the rest of the trip. My path was from Hanoi to DaNang. I was caught off guard when I had to get off the bus in Hue and wait for a second bus. No one informed me of this change until we were at the stop and I still had to ask questions to know I needed to get off. I assume if I hadn’t I would have been responsible for finding transportation from wherever I ended up back to Da Nang so be careful! 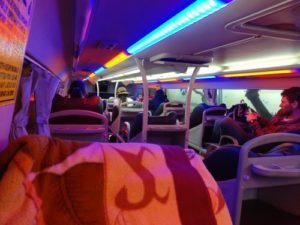 In conclusion, my advice for the sleeper buses in Vietnam is to go prepared and relax and enjoy the ride. Don’t expect too much and just enjoy the experience! Post a comment below if you have additional tips or stories to add! Da Nang was definitely worth the long bus ride! If you want to read about the night market in Hanoi, read this story! You can also check out my tips for travelers with narcolepsy!